Want to load up on fish high in Omega-3? These crisp and refreshing Greek Pitas With Sardines offer up a healthy dose of Omega-3s and a whole lot of flavor—perfect for an easy lunch or light dinner. But I recently upped my lunch game with this hearty Greek pita topped with crunchy fresh veggies and tender sardines. It’s simple to make, it’s wholesome, and it’s hella satisfying. So okay, it might not compete with my husband’s fancypants downtown luncheons—but it sure as heck looks pretty. And it tastes just as good. This recipe drops the elements of a refreshing Greek salad on top of a tzatziki-smeared pita and finishes things off with nutrient-packed sardines. But not just any sardines. I’m talkin’ King Oscar’s Brisling Mediterranean Sardines, hand-packed in a Mediterranean-style sauce made up of quality extra virgin olive oil, red bell pepper, sliced black olives, herbs de Provence, and garlicky goodness. Not only is this a convenient at-home lunch, but you could easily turn it into an on-the-go meal. Pack a pita, a container of your greens and veggies, a wee bottle of tzatziki, and a tin of King Oscar sardines, and you’re set. Or, wrap it up gyro style! Sardines: a Fish High in Omega-3. Omega-3 fatty acids are important for many reasons. They help prevent heart disease, reduce the risk of blood clots, and lower blood pressure. On top of that, omega-3 fatty acids act as essential building blocks of fetal brain development, so it’s important to consume a fair amount of them throughout pregnancy. (And I am!) The bonus? Sardines don’t come with the worry of mercury like their tinned friend, tuna. King Oscar products are packed in certified BPA-NI cans, and these sardines are fished from Norway’s fjord’s and coastal waters. To learn more about buying sustainable seafood, click here. This Greek Pita With Sardines is a fab and wholesome lunch with crisp cucumbers, tomatoes, red onion, olives, and tangy tzatziki. Drain your can of sardines. Slather the tzatziki over the pita, then top with the mixed greens, cucumbers, tomatoes, olives, red onion, and capers. Top the pita off with the contents of the sardine can. You can place the fillets on whole, or roughly chop them them place them on. Feast on the pita as is, or carefully roll it up with foil and enjoy it like a gyro! 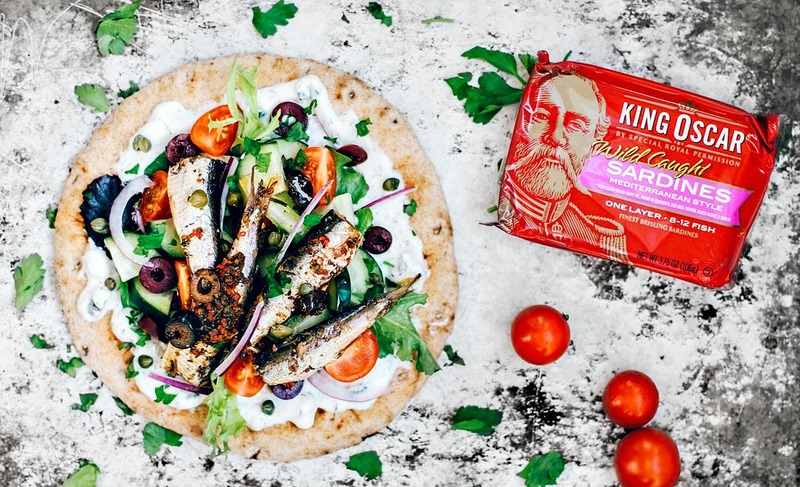 If you can't find the Mediterranean-style sardines, you can use King Oscar's brisling sardines packed in extra virgin olive oil; add a spritz of lemon juice for extra flavor. Want to make your tzatziki from scratch? Try my recipe! This is everything my husband could wish for in a lunch. He loves to eat meals like this, but we rarely think of ways to do them at home. I know that I'm running out to the store to stock up on some sardines now because this is undoubtedly making its way into the meal rotation. And those omega-3's are poorly lacking in our home, so I am so excited to add in a natural source instead of another pill! Where have I been? I can't believe how easy these are to make. Plus all of that nutrition....and to think these are sitting in the pantry just waiting to be gobbled up inside of a pita!! So simple! Who knew? We need some new ideas for lunch. Now that Hubby is retired and at home we eat more lunches. I used to just nibble on something and forget lunch. We really like seafood and these sardines would be great to have on hand. We make homemade pitas so the Greek pita idea is great. First of all, so excited for you and your growing family! I feel like there's some kind of fish pun to be made here... something about small fry.... In any case, I love this recipe. Sardines are great, and it's a shame that they've become something of a culinary punchline. I'm really happy to see writers like you championing them and doing such delicious things with them. Cheers! I hope your husband at least doesn't send you photos of the awesome food he's eating like mine does. :) But at least now you can take a bite of your own awesome sardine pita and be happy with your lunch! I love making pita rollups for lunch and these Mediterranean sardines look like just the way to perk things up around here too. This looks like a fancy-pants lunch to me! Probably even better than your husband's and healthier, too! I love that you've slipped in some omega 3's with the sardines. It's sometimes hard to get them in the diet. Lunch slump - YES. That is totally me these days. Because the weekdays are SO busy for me, I usually lunch prep on Sunday and it's just a big salad for everyday. BORING. I need to add this in to spice things up! Plus I LOVE sardines! My husband loves sardines and I hesitate to buy them because I simply don't know how to prepare them or what to pair them with-- thanks for this recipe and guidance. My husband will surely thank you and I am happy to have a healthy option for our meals. Oh my, these gems looks absolutely amazing. My husband is half Norwegian and he (and so am I) is a HUGE fan of King Oscar. We don't eat sardines a lot, but we do enjoy them. And the use of them in the beautifully prepared Greek pit looks perfect. And thanks for the recipe for Tzatzkik sauce, I will be making it, along with these pitas very soon. Thanks for the awesome recipe! Now, this is like a play on fish tacos LOL. What an interesting combination of flavours happening here. I LOVE gyros...and I really need to find these sardines. I will have to look for them next time I am shopping. We love smoked salmon and smoked oysters...might as well give these a try too. Where do you get them? My husband and I LOVE sardines and always have them in the pantry. Hubby would be ALL over this greek pita. I can't wait to give this one a try. Love the Mediterranean flavours goin' o here. So much better than a basic sandwich, that's for sure :) Pinned! Hope you love it! Let me know. I can't get enough of this one lately.